Previous See you at Jozi Book Fair!! In For My Brother, Nkosithandile chronicles the interplay between a rebellious brother and his sister tripping over the loose ends of a romantic relationship gone awry. For such a young writer, she explores some weighty themes including: the generational influence of HIV/AIDS and grief. We spoke to the young woman behind the story to get to the heart of it. Black Letter Media: How did you start writing stories? 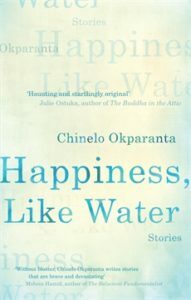 Nkosithandile Peme: I grew up in a household where the love of reading has always been treasured, whether it be newspapers, magazines or novels. So, I guess that’s where my love for reading stemmed from. It was in high school that I fell in love with writing especially when it came to essays and creative writing. And ever since then, I’ve been writing. BLM: How did you come up with the plot for “For My Brother”? NP: “For My Brother” was actually inspired by a song sung by American singer, Jhené Aiko and the death of my cousin. She sings about losing her brother to cancer. And I wanted to reflect on my cousin’s death. He died from a chronic disease, the same illness that the character suffers from. But the character amazes me because she doesn’t allow the illness to define who she is. Instead she accepts who she is and is there for her brother who is going through a difficult time. Somehow I once wished my cousin could have adopted the attitude of the protagonist. He’d still be here. BLM: As a writer, what draws you to the short story form? NP: Short stories are simple. They aren’t complex when it comes to reading or writing like how novels are. They can be read and enjoyed in a short space of time. NP: “America” by Chinelo Okparanta and the classics such as Cinderella and The Three Billy Goats Gruff. BLM: You are a bookkeeper, creative writing student, blogger and writer? It’s admirable. How do you manage to find time to write fiction? NP: It’s a mission. (Laughs) But it all depends on how I plan my time. My studies are always my first priority. I put aside two hours a day for my assignments and anything related to school. Blogging is a now and then thing – I preferably do it on weekends when I’m not that occupied. And when it comes to writing fiction, it depends on the mood that I’m in. If I’m exhausted or feel a bit gloomy then I’m not going to bother myself with any writing. But I write almost each day on my bed. BLM: In terms of writing. What we expect from you next? NP: I’m working on a manuscript – The Rabbit in the Red Dress. It’s a children’s book and it’s creepy!!! But I’m having fun writing it. And I suppose other more good short stories. Nkosithandile Bernedetta Peme is a writer based in Johannesburg. Several of her written work has appeared in the Visual Verse online anthologies and on Fundza. She regularly writes (risqué) articles for an entertainment blog, Just Curious. Born in 1995, the pint-sized writer is an assistant bookkeeper and part-time student at UNISA, studying towards a degree in Creative Writing. She is an avid reader and writer who is always seeking new stories that will inspire, motivate and excite readers. 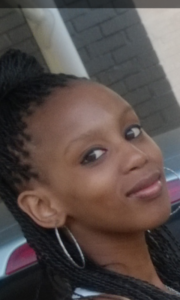 Nkosithandile enjoys dancing and playing “mother” to her naughty niece on weekends. And the story that lies behind her gap tooth – is a very interesting one.